A plucky farm dog will do anything to get a job—even be a cow! When a farmer tells a dog that “dogs just eat and don’t give anything back,” the dog is disappointed, but not discouraged. He’ll try being a cow, a horse, and a chicken before he’s done. As the farmer learns the value of a good dog, children will laugh as the dog finds his rightful place on the farm. Teresa Batemen's endearing story celebrates persistence, ingenuity, and the fact that everybody can make a contribution. Award-winning artist Chris Sheban's illustrations are filled with warmth and humor. Kids and parents will love this terrific read aloud with a subtle message about never giving up. Nominated for The Washington Children's Choice Award, The New York State Charlotte Award, the Young Hoosier Book Award, and the Virginia Readers' Choice Award. 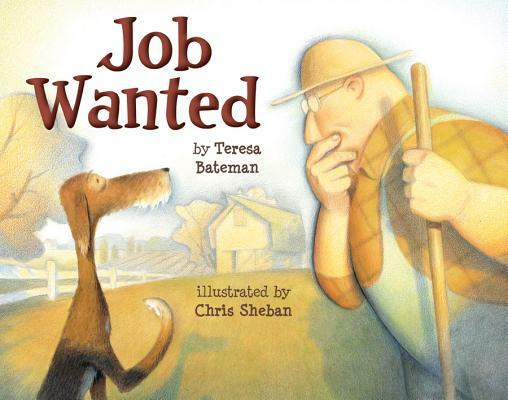 Teresa Bateman is an award-winning storyteller and school librarian. She has won both the Storytelling World Award and the Anne Izard Storyteller's Award. Her books include Red, White, Blue, and Uncle Who? and Keeper of Soles, an ALA Notable Children's Book. She lives in Tacoma, Washington. Chris Sheban has been awarded three Gold and three Silver Medals from the Society of Illustrators. His picture books include What a Cold Needs. He lives near Chicago, Illinois.